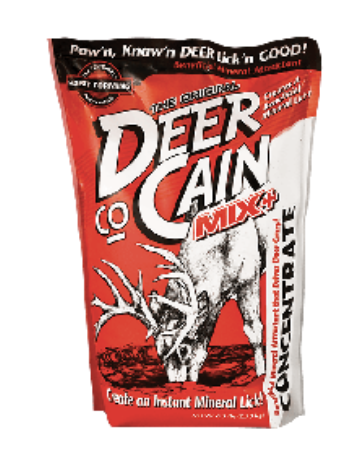 The Deer Co-Cain formula reacts with moisture to release vapors that will bring deer to a highly active mineral site. The powder formula is as concentrated as it gets and covers more area than brick and liquid forms. They’ll love how it tastes, and you’ll love the results. Minerals can help pattern deer year-round, but bucks and does consume different amounts seasonally depending on their needs. Early Spring: Mineral consumption is high due to does carrying fawns and bucks seeking out minerals to grow new antlers. Spring: Mineral consumption remains high while does nurse fawns and bucks continue antler development. Summer: Deer consume minerals as needed for improved overall health, including healthy digestion. Bucks reach final antler growth potential during this time. Fall: During the rut, does consume more minerals and bucks consume fewer. However, rutting bucks will seek out mineral sites in search of does who have visited the site. Winter: Mineral consumption aids in preparing the herd for the cold months ahead.